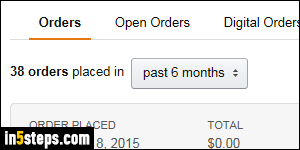 Amazon.com keeps on file your entire order history: by default, only your orders for the past 6 months are shown, from most recent to oldest. The orders page is split between physical items and virtual items, like Kindle eBooks, MP3 music and downloadable audiobooks, etc. Cancelled orders are also on a section of their own (you can see the links in the screenshot - anything you've ever ordered on Amazon will appear under one of these categories). To view your most recent orders, mouse over your name in the top right corner of any page (after you've logged into your account), and select Your Orders from the dropdown. 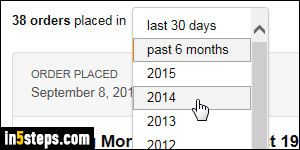 To view orders you placed for a specific period, pick a time span or year from the dropdown, as shown on the screenshot. Great tool when filing your taxes, and you're trying to find tax-deductible business expenses! Digital goods don't go through a cart, so each virtual item you purchase becomes its own order - easy enough. When you buy physical goods, a new order is only created when you check out: that order contains anything you bought, whether sold by Amazon or a third-party seller. 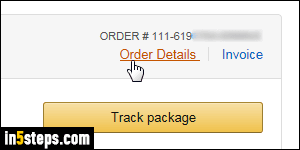 Depending on the number of items you purchased in a single order, not all items may be visible on the main order history page. To see all items, click on the Order Details link. If you don't remember when you purchased something, but you remember the name of the product, or a keyword it contained, you can search your order history. 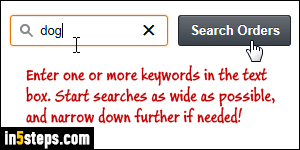 Type something in the Search all orders text box and click Search Orders. Notice from my example that you can be pretty vague: as long as that word appears in the product description, Amazon will find the item! Since Amazon searches your entire order history, no need to specify a date: every match will be return, showing your most recent orders first. As you can tell from the screenshot, it looks at every single order you placed - books, toys, food, etc. You can click on each item's "Order details" link to get more specifics, like price, seller, package tracking information, and more. Note that these search results also include items from your Subscribe & Save orders.